On the sidewalk in front of his house , 4-year-old Josue Hercules, a little, dimpled boy with a mighty man's name, was playing with his older sister, Katherine. Down the street, 46-year-old James Landrum, who had a history of gang activity and criminal convictions, was arguing with a group of adults. He pulled a gun and opened fire. The kids ran at the sound, but one of the bullets hit Josue in the back of the head, skirted his skull and lodged near his right eye. His 7-year-old sister carried Josue to the house. Their mother, Wendoly Andrade, rushed Josue to the hospital because the ambulance took too long. On the way, Andrade put her finger in the bullet hole to keep Josue’s head intact. She watched his eyes roll back in his head, felt his body lose its warmth. What followed was a blur - an induced coma, blood transfusions, and surgery to remove the bullet. Josue survived. 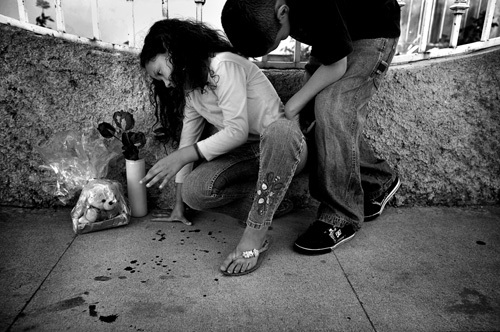 Josue Hercules' cousins visit the spot in Long Beach where Josue was shot.